All the guys in my golf league first laughed at me at still using wooden fairway woods until I crush my 3 Ginty out of deep grass 270 yards. Suddenly theres quiet. Found a used 7 wood that I bought for $10. Gave it to my father-in-law Dean Richardson who promptly used it on a 165 yd. par 3 hole. Hole in one! He's having leg and back problems so he's hanging up the clubs. He made a special trip to my house to present the Ginty 7 back to me. I love these clubs! 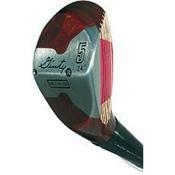 I still swing a full set of Gintys - Sand to 3, metal 3 wood, and the classic 5 wood. Ahhhh - what confidence they instill. With their chevron shaped base, I know I can slice through the turf with minimal club speed reduction and still make strong contact to send the ball flying. The only thing I'll change is the shaft since I've been swinging these since I was 15 and I'm about a foot taller. If you find a set and want a petit head with a beautiful matte finish, grab 'em, and enjoy for the next 30 years. Model Reviewed: STAN THOMPSON "GINTY"
The original "Ginty" had the pitch of a 7 iron, and got the "Average Golfer" out of alot of troubled "deep rough" lies. I have owned at least 3 original Ginty woods and also had a complete set of Ginty woods which I enjoyed......nothing though compared to the original Ginty!